From the Wall Streeet Journal, a chart that is much in the news today. Posted for future reference. Source credit added to the post. Thank you, Dave. Obama's been smart to show he took office at the lowest point and since then things have been getting significantly better. He has run ads based on this chart, which I think should be very persuasive. I wonder how many of those jobs are non-government jobs? I don't see private sector jobs improving. "Since Obama's first month on the job, total government has lost 600,000 jobs. (He's a pretty bad socialist, apparently.) The goods-producing sector, which includes manufacturing and construction, is still down 1.6 million jobs -- as many jobs as we added all of last year! All the growth has been in services, where we've added 1.3 million new positions. " @Anon5:10: I don't think the average unemployed American or most other nationalities, care where the jobs come from, as long as there are jobs. 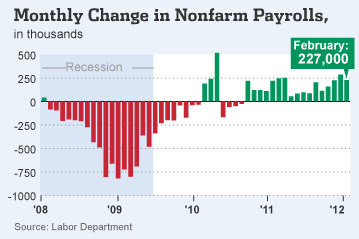 Does that "increase in payrolls" account for the increase of oil prices and the decrease in the value of the dollar? Let's see, if you earned $4,000 a month in 2008 you'd have to earn 4,201 to break even. Who's been getting a raise over 5% a year these past few years?